Orange drops are made from polypropylene film and foil. 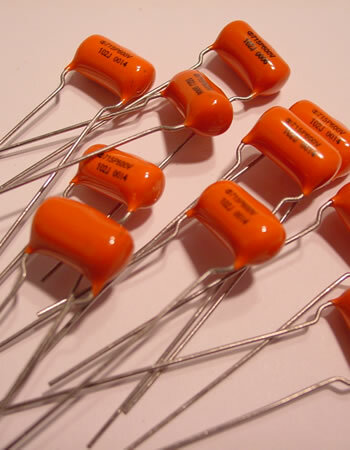 They have many advantages over ceramic, tantalum or aluminium when used in guitar amplifier circuits. The offer a high pulse current rate and extreme stability. The have excellent current carrying capacity and offer extended high frequency response. They provide the sound and definition of the old capacitors that are found in vintage amplifiers and for this reason they have become the industry standard upgrade for all guitar amplifier circuits. Orange drops 715 p are made from polypropylene film and foil. They have many advantages over ceramic, tantalum or aluminium when used in guitar amplifier circuits. They offer a high pulse current rate and extreme stability. The have excellent current carrying capacity and offer extended high frequency response. They provide authentic vintage sound of the old capacitors and for this reason they have become the industry standard upgrade for all guitar amplifier circuits.